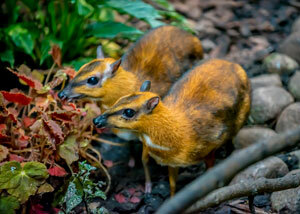 The Milwaukee County Zoo welcomes two female Malayan chevrotain to the Aviary. The animals arrived mid-October 2017 from the Bronx Zoo in New York. The two females, named Opal and Rain, are now becoming more acquainted with the Zoo, and settling in to their new home. The Zoo has not displayed chevrotain since 1995 when they were exhibited in the Small Mammals building. The chevrotain are part of a mixed species exhibit located in the Aviary’s existing Mousebird Exhibit. They live alongside the Luzon bleeding-heart doves, the black-naped fruit doves and the white-rumped shama. So far, the chevrotain and the other species in the exhibit are living together quite seamlessly. Chevrotain are nocturnal and are more active during the night. When they are awake, they eat an array of food, including an herbivore pellet, a variety of vegetables and hay. Known as a mouse deer, the chevrotain falls under a unique category, in which they are not related to deer, but rather belong in a separate category of hoofed mammals. The weight of these animals varies, and can be anywhere from 4 to 33 pounds. Chevrotain have two long fangs that males use for fighting. In the wild, chevrotain can be found in Africa and Southeast Asia. The chevrotain are solitary or live in pairs. They live among the leaves and twigs, sometimes venturing onto low trees and branches. Stop by the Aviary to visit the chevrotain duo, in addition to checking out the birds that share a home with them.